WALTER – When bad storm clouds roll through Cullman County, they always seem to have behind them the silver lining of service: bringing out the best in people as neighbors help neighbors, and even total strangers step up to offer acts of kindness. The March 19 storm may also result in one more long-term benefit: research being done on the Cullman hail storm could lead to safer and more storm-proof buildings in the future, as well as more accurate reading of weather radar during storms. On Wednesday, Ross Maiden and Scott Fowler of the Insurance Institute for Business and Home Safety (IBHS) Research Center in Richburg, South Carolina visited Cullman County to see for themselves what hail did along a swath from south Cullman to the Walter community, and to perform 3-D laser scans of five large hailstones collected during the storm and preserved in Walter. In an ongoing project led by IBHS Lead Meteorologist Ian Giammanco, the Research Center’s Hail Field Study is collecting data to improve the interpretation of hail in weather radar images, and to create more realistic hail impact tests for building and roofing materials. According to the IBHS website, “When it comes to innovation, dual-polarized (dual-pol) radar is one of the biggest achievements in advancing our understanding of the weather around us. The National Severe Storms Laboratory took more than 30 years to develop and implement dual-pol radar, which improves forecasts and response to severe weather by determining the amount of falling precipitation, differentiating between hail and rain, and accurately showing when a tornado touches the ground. “As hailstorm damages increase, sometimes eclipsing a billion dollars a storm, the need for more hail research has never been greater. Building upon dual-pol radar’s significant benefits, IBHS is conducting a multi-year research project studying the damaging impact of hail, as well as improvements to radar detection of hail. “After traveling throughout the Central Plains and collecting measurements on falling hailstones from 60 different storms, IBHS is reviewing its field data and analyzing how it could be used to improve radar detection of hail. The prospects are exciting because IBHS’ ground truth data will be compared with the dual-pol measurements taken by the National Weather Service for the same storm, and could have a profound impact on improving dual-pol radar algorithms that influence the radar detection of hailstones. As a result, this information can improve forecast warnings and hail swath products, potentially reducing the opportunity for fraudulent hail-related insurance claims. “In addition to the innovative measurement work, IBHS also has a wealth of information from 3D scans of hailstones gathered during field research. The 3D scans provide a unique opportunity for IBHS to create digital representations of hail and more accurately recreate hailstones. While setting up the scanning apparatus in Walter, Maiden told The Tribune, “We have a small hail lab that we do impact testing on, and we’re trying to standardize that. So, from what we do, we can get very accurate densities, because we can get volume, and with the weight we know our densities, so we can replicate those densities in our lab that we’re seeing. Fowler added, “What they do (currently) is they drop steel balls onto the shingles to test their impact rating. But your hailstones don’t look anything like steel balls; they don’t act like steel balls. 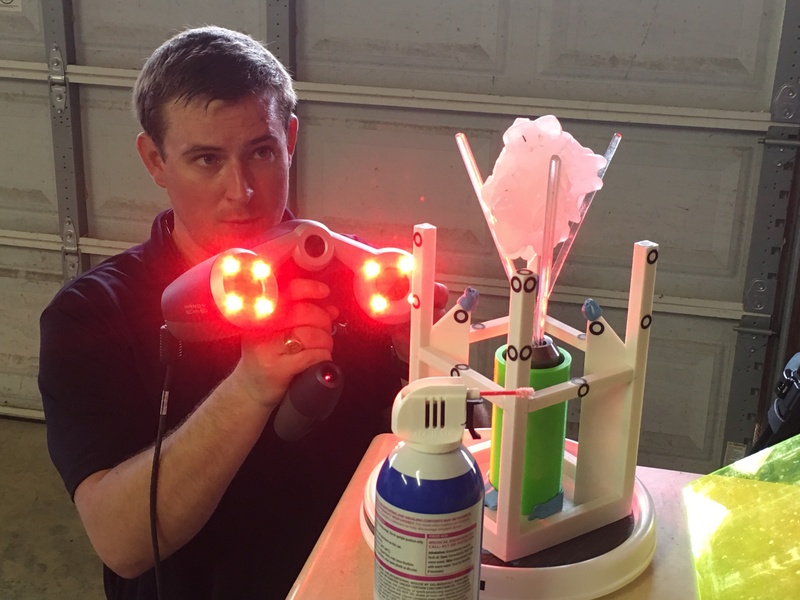 The 3-D scans made Wednesday could be used to produce realistic molds of non-spherical “spiny” hailstones, such as those that fell in several areas of Cullman County in March. Lab-created hailstones from those molds could be shot from the Research Center’s air cannon to test the resiliency of current building and roofing material samples against “real-world” hail, helping insurance companies figure out how sturdy a building might be when writing policies, and helping material manufacturers develop stronger materials. For more on the IBHS, visit https://disastersafety.org. Next article‘Paws in the Park 2018’ sees adoptions galore!